Milan 24" Single Sink Vanity Set in Espresso - Design Element - SKU# DEC022 The Milan 24â€ vanity is elegantly constructed of quality woods. The single piece porcelain drop-in sink design brings a simplistic and contemporary look to any bathroom, while beautifully contrasting the rich features of the espresso cabinetry. This contemporary design includes three drawers and a soft-closing cabinet door, all adorned with satin nickel hardware. A combination mirror and espresso medicine cabinet is included. The Milan Bathroom Vanity is designed as a centerpiece to awe and inspire the eye without sacrificing quality, functionality, or durability. Dimensions23-1/2â€ x 17-3/4â€ x 34-3/4â€ Faucets not included. 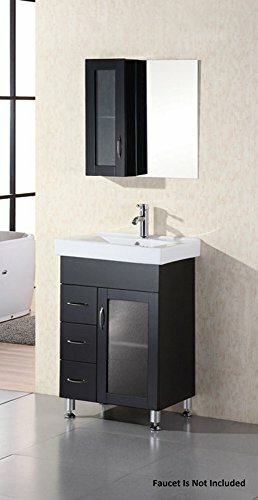 Silkroad Exclusive HYP-0220-BB-UWC-26 Cambridge 26"
Silkroad Exclusive Bathroom Vanity HYP-0711-T-TT-26 Vanessa 26"
Silkroad Exclusive Bathroom Vanity HYP-0715-BB-UIC-72 Ashley 72"